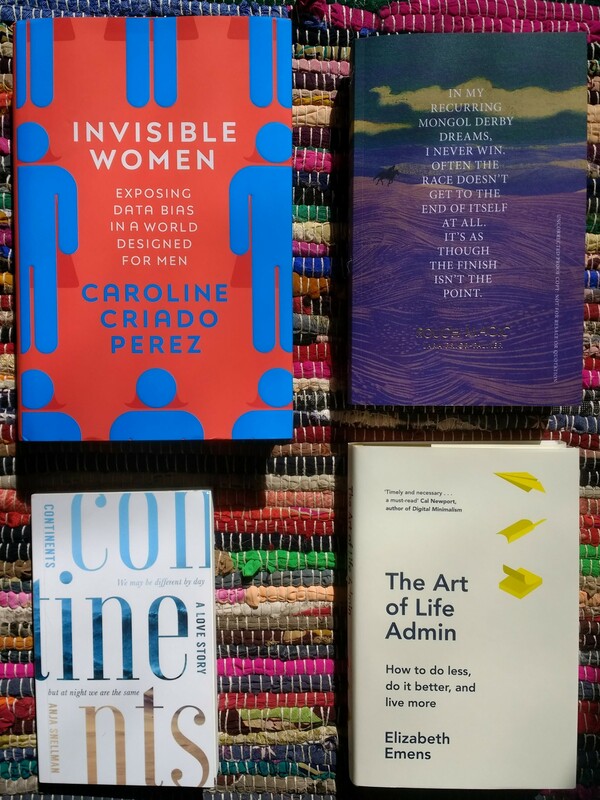 Caroline Criado Perez – “Invisible Women: Exposing Data Bias in A World Designed for Men” – lots of people have been talking about this although I’ve not seen many reviews on people’s blogs. I’ve read quite a lot about this one and am itching to get into it. Lara Prior-Palmer – “Rough Magic” – Yes, she’s Lucinda’s niece (this will make sense to horsey folk) and this is her story of riding the Mongol Derby in the hoofsteps of Genghis Khan, aged 19. It sounds so exciting but will be the last to be read as it’s out in June. Elizabeth Emens – “The Art of Life Admin: How to Do Less, Do it Better, and Live More” – well, a book about life admin I need to find time to review (ha ha), and so far I’m at the descriptions of what life admin is, about to plunge into its gendered nature. Anja Snellman – “Continents: A Love Story” – a Nordic bestseller that’s not a grim crime novel, tracing Oona and Alex’s love story across the continents. Look out for my review and giveaway! Paul Jarvis – “Company of One” – talks about the benefits of staying small rather than scaling up as a business – exactly what I’ve done, having had to make some conscious decisions after my work grew to fill my time, so it’ll be interesting to read about this now being a Thing. Ayisha Malik – “This Green and Pleasant Land” – Bilal and his wife Mariam live a not-particularly-Muslim life in a sleepy English village, but what happens when “Bill’s” mum’s dying wish is for him to build a mosque there? When aunty comes to visit from Birmingham, chains of events are triggered. I’ve read this novel and will be reviewing it tomorrow and it’s charming and funny and has a lot to say about division and unity in England. Mark Boyle – “The Way Home” – Apparently this chap has already written a book called “The Moneyless Man” and here he does without technology. Gulp. Have you read any of these? Do any of them take your fancy? What’s new on your shelves – real or virtual? Well I’ve got a lot to tell you about today, having not blogged since the weekend, so here’s some Shiny Linkiness, a sweet book that wasn’t my Iris Murdoch and some purchases! 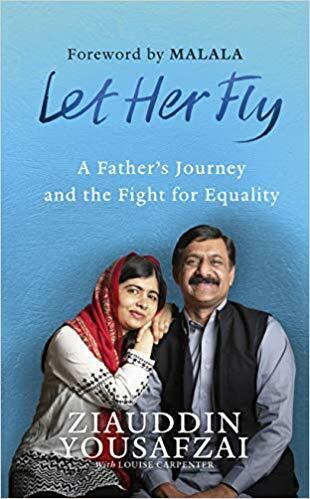 Now, we can argue about nature and nurture, can’t we, but what is clear is that the extraordinary Malala would not have got as far as she has without this background and this amazing man pushing her onwards and opening the gates of education for her. They form a great team, and still work together on the Malala Foundation. But he doesn’t idolise her and put her on a pedestal, and he’s very honest on the family dynamic and especially his relationship with his own sons. I bought this on a trip to Penzance from the lovely second-hand bookshop on Chapel Street, a dear old Penguin from 1960. A charming sequel to “Mrs ‘Arris Goes to Paris” in which Mrs H, South London daily, plus her doomy friend Violet, ends up in New York and also in possession of a small boy she has liberated from next door. While the introduction of some trendy late-50s culture misses the boat a bit, the return of an old friend and the addition of some super new ones is lovely, and the whole, if slight, is warm and a joy. Partly told in letters, which makes for a very sweet read. So do we remember when I bought some books cheap at The Works because they were Christmas books and it was January? Well of course they were all in series, weren’t they, and not the first in each, and they were about Cornwall and I found second-hand copies cheap and although I left one alone, I now have this. And then on the Prosopagnosia group (read about proso or face-blindness and me on my business blog here), there was mention of a YA novel with a whole prosopagnosic hero and so that had to be got, didn’t it? So there we go. Currently reading Janet McNeill’s “The Maiden Dinosaur” which is brilliant, then it’s on with the Murdoch, I promise. It’s not as wonderful as I remembered it being, but one’s bound to dip down after all the promotions up the favourites list. Have you been naughty recently? What do you do if you accidentally buy the middle book in a series? They don’t count, right? First off, sorry if you’ve commented on my running or books posts this week; I’ve got myself all behind like a cow’s tail, but I have a weekend off this weekend and am going to spend at least some of it doing blog admin – also including reading the blogs I’ve fallen behind with. Anne George – “Murder Runs in the Family” – one of the Southern Sisters cosy mysteries, set in Birmingham, Alabama! 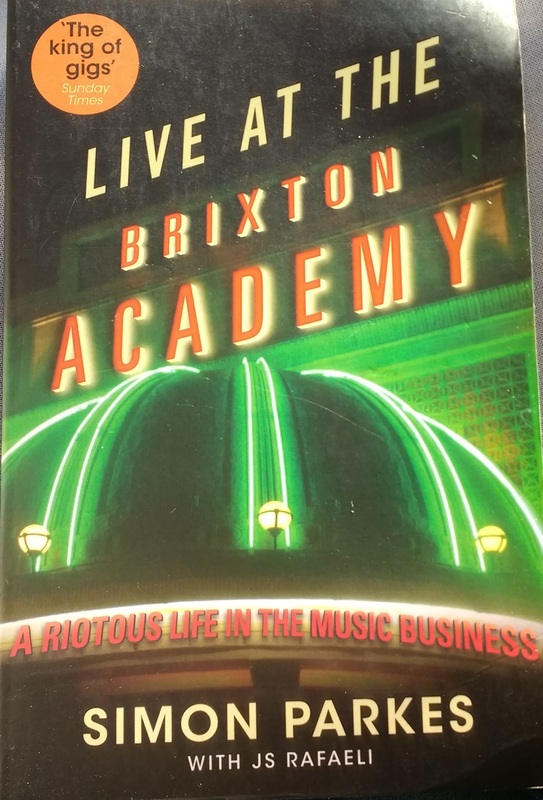 And another confession -all those books in and I popped into the newish Acorns charity shop to look again for the bookcase I know will eventually appear there that fits in THAT space just perfectly (next to the bathroom door, left-hand side) and they have their book stock in there and here’s a history of the Brixton Academy music venue, where I’ve seen Green Day, Eels, Foo Fighters and Lamb (Simon Parkes’ “Live at the Brixton Academy”), so I couldn’t leave that there, could I? Right? 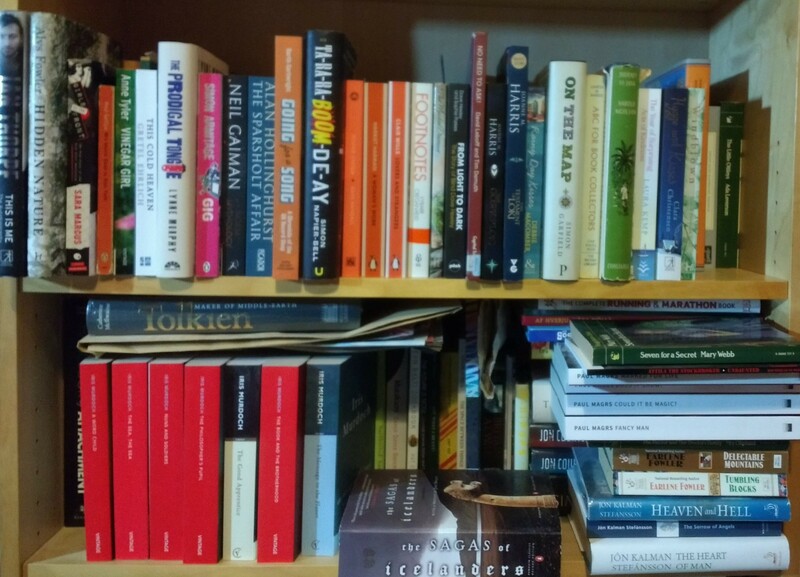 So along with the associated piles (books in series where I’m waiting to get the next one; big Icelandic sagas book on the back row, those Christmas Cornwall books waiting for Cornwall or Christmas …) I have exactly the right number and size of books to double stack my TBR shelf exactly. Which is some kind of achievement in itself, of course. I’m sure. 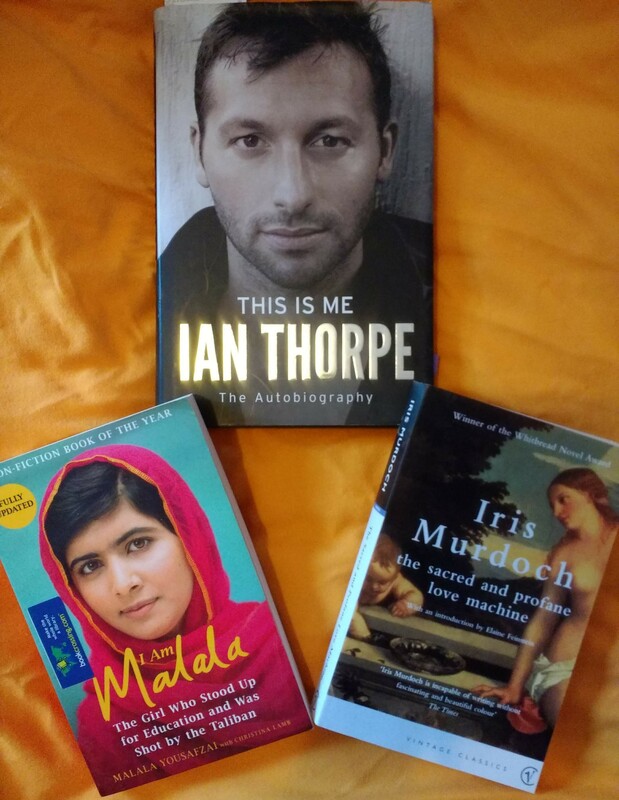 Currently reading and up next: I’m enjoying Ian Thorpe’s “This is Me” – a bargain in Foyle’s last January from the front of the TBR. Then up next is Iris Murdoch’s “The Sacred and Profane Love Machine” which is February’s IM Readalong book, and “I am Malala” so I can have a sort of February Malala Fest. How’s your TBR looking? As robust, at least, as mine, I hope! Having committed to a slightly unusual way of reading my TBR, I picked off the NEWEST book that had come in at the time to read next. * This was one given to me at the county cross-country championships by my friend Kate from the running club, after I’d asked to read the copy she was offering to people. Several people have touted this as the best running/sport book they’ve read (it’s actually a triathlon book, and she came to the sport from the swimming side, but there’s plenty about running in it). Unfortunately, I can’t quite agree – I really didn’t find her relatable, although there’s a huge amount about her to admire of course, and I had difficulty reading about some of the issues she faced. It’s clear that Wellington has always been incredibly driven, and this is why she managed to excel in a sport she only took up relatively late. She’s stubborn and she admits she rushes into things, leading her to injure herself often and not get on well with her teammates in her first professional set-up. More importantly for me, in the early part of the book she details falling into two different eating disorders, with rather too much information about how this happened: I find it difficult to read about such things and although she does explain how she climbed out of them and acknowledges the help she had, it does feel rather that she swapped one compulsion for another, having previously enjoyed sport for the social side and then become driven to the point of, for example, swimming with a broken wrist inadequately waterproofed and getting an infection. Okaaaaay! I liked her race reports and enjoyment of racing with amateurs (she even has a chapter dealing with various charity fundraising, adversity overcoming and brave amateurs she admires). She mentions her mum taking an exam in swimming timekeeping and judging, which is the first mention of this kind of thing I’ve seen in a book (though she fires a gun to start a race in the book so must have done some exams herself!). An unusual and late-developing talent is still torn down then built up again by a first coach who is very harsh indeed, and while this was interesting to read about, it was so alien to my experience or anything I’d want to experience that it was very hard to read (I know people have different ways and we can’t all be the same, but it was just alienating to read it). So a decent and interesting book but not the best book on sport I’ve ever read. I was glad to have the chance to read it, though! Those naughty books – so we have “Confetti at the Cornish Cafe” by Phillipa Ashley, about a cafe holding a wedding (no, you don’t say); “Christmas at the Little Wedding Shop” by Jane Linfoot, and “Christmas on the Little Cornish Isles” by Phillipa Ashley again – this one set on the Isles of Scilly! I rather suspect these are all some way through series, as they were all out on The Works’ Christmas themed shelves (and now reduced to £1 each) so I might be forced to look for the others or might save them for my next trip to Cornwall or Christmas and read them all then. Anyone familiar with the series? And how do you read YOUR books? * Because Grab the Lapels does something similar but not exactly the same, she has asked me to share her link about her way of doing it, which I share gladly here. I pulled this off the TBR a little out of order because it was the first smaller book on the shelf which would bear rattling around in my rucksack for a day out officiating at cross-country: I knew I’d have a bit of reading time while my friend Dave zipped round parkrun on the way. My lovely friend Laura bought this for me when we met up last year as a birthday present – how lovely to march round the charity shops of Stafford demanding books! I have a new plan for reading my TBR which might happen and might not: the oldest, the newest and one from the Kindle, in rotation (apart from my Murdoch a month and any review books that are in). Might work, and will let me get to my latest acquisition sooner (see more on that below). Not a standard Anne Tyler (and I thought it would be her last when I got it, as she’d announced that she would stop writing: I will be getting the paperback of her new one as soon as it comes out …) as it’s a retelling of Shakespeare’s “The Taming of the Shrew”. Now, while I remember the main characters and their characteristics, and the vague outline of the story, I’m not going to do a blow-by-blow comparison. I love Tyler and I found myself just reading it for that aspect, as a novel by a favourite author. The retelling is in there, though, and cleverly done, although her characters are always quirky and you can’t think that just any woman would behave as Kate does. 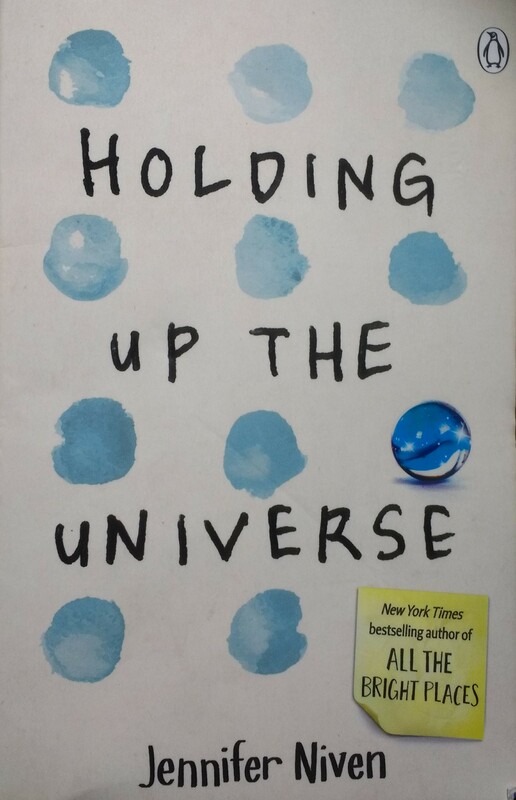 So it worked as a novel on its own and was entertaining and a good read. Kate was believably mardy, as she is supposed to be, but her home set-up with her dad and his systems and her very different sister was completely Tylerian. The family and their relationships, including with aunts and uncles, are as beautifully done as you would expect, and the overseas characters are drawn carefully and their accents got across through their grammar, which we’re however reminded is not the only thing about them, but is used to show Kate’s thinking and noticing (I’ve just been reading a blog post from Louise Harnby about how to express accents in fiction (here) which is why this struck me, I think). A good read. I did mention this on my running round-up post on Sunday, but for anyone who skips those, a new acquisition. I have to mention that only I could be officiating at a county cross-country match and STILL manage to acquire a book – my friend Kate from running club had offered to pass it to me but we’d not coincided until now, so she managed to get it to me in a gap between a race starting and me timing it through at the finish, after her own race. Good work! 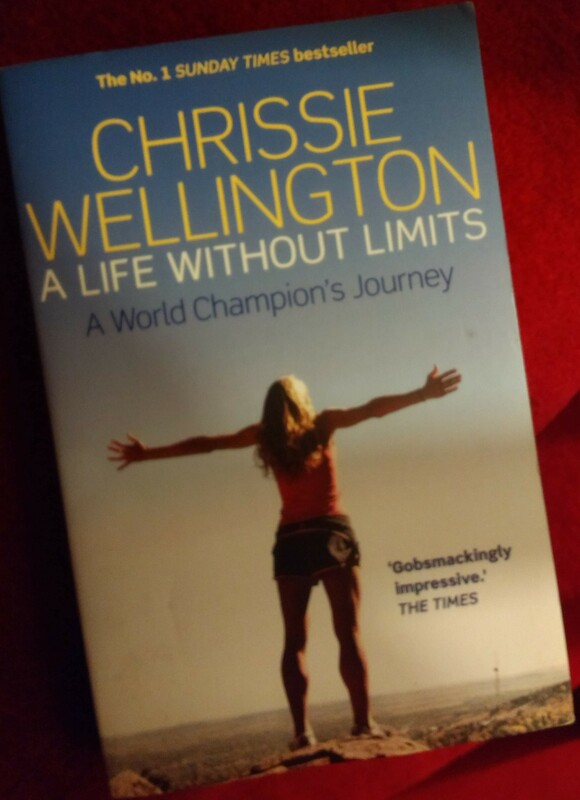 “A Life Without Limits” is meant to be one of the best sporting autobiographies ever and I can’t wait to dive into it: I know I really enjoyed her book on how to do triathlons even though I have absolutely zero interest in doing a triathlon! A natural book for me to receive as a present – on my wish list then off again. Amusingly, I think I was alerted to its existence by Simon Stuck-in-a-Book’s review, published exactly a year ago today! An interesting book listing 99 books that Fowler, working on a column for the Independent and with a focus group of which half had to have not heard of the author, has decided are forgotten. Being alphabetical, it was a bit odd to start with Margery Allingham, who I’ve very much heard of: then again, I’m a big reader in my middle years who had a propensity for the mid-century book, so maybe fewer of them would be forgotten to me. There are also longer essays on the most prolific authors, writers who deserve to be forgotten, etc. I did take exception to a few of them, not just Allingham. Georgette Heyer is constantly in print and found in The Works among other shops, and Delafield, Comyns and Watson have been republished by Virago and Persephone or other imprints and talked about … but maybe only in my immediate “bubble” I suppose. There were plenty of people I hadn’t heard of, although lots seemed to be crime and mystery writers, so this book wasn’t as hard on my wish list as I’d feared (this is a Good Thing, though!). It was exciting to see Frank Baker’s “Miss Hargreaves” mentioned, as that’s one Simon has always highlighted, and the personal touches were nice and entertaining – Fowler re-buying his own copy of a childhood favourite and getting a mention in the dedication of a republished novel by one of his finds, as well as his use of an Arthur Mee technique for slicing bananas. An ideal Twixmas read for dipping into. 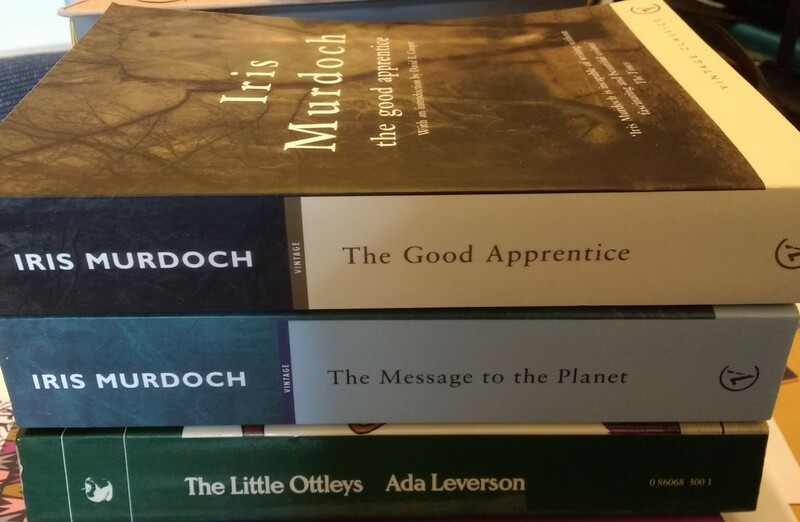 So it had become time to think about buying some more of the Vintage Classics red-spined Iris Murdoch reissues with their interesting introductions, as I’ve only got one left and they can take a while to come. Imagine my horror when I discovered Vintage are reissuing them AGAIN, this time with flowery covers, presumably for IM’s centenary in 2019. I couldn’t face having my “newer paperbacks” run (this is as compared to my UK first editions run and my “my original paperbacks” mix of Triad Granadas and Penguins, plus my incomplete sets of “early Penguins” and “horrific 70s covers”, hope you’re keeping up at the back!). What does a girl do when presented with this horror? Buys the last 11 (make that 9) all in one go. Amazon never seem to quite promise to have the right ones, so I ended up buying those that are available with the red spines from Foyles and the rest that aren’t even available in that edition (but do have introductions, apart from the ones that don’t). And Vintage (which is an imprint of Penguin) never did reissues of “The Green Knight” or “Jackson’s Dilemma” so I will have to stick with my older copies of those, leaving me to have 24/26ths of the books in the new editions. The confusing editions are here and I really don’t trust them to do them all, so I’ll stay with what I have (also, where’s there a Swiss Cheese Plant in “The Sea, The Sea”??). Anyway, here are the first two (non-red-spined ones) to arrive, plus a copy of Ada Leverson’s “The Little Ottleys”, which I bought for Ali for her LibraryThing Virago Group Not so Secret Santa gift then decided I wanted, too (I will pass along my copy of “Love’s Shadow” the first in the set, and that means this one doesn’t count as I will only need to read 2/3 of it, right?? I picked up a fairly mild but annoying cold on Christmas Eve, and although it’s hampered my attempts to have a Christmas dinner and get some running and yoga in, it has allowed me to get a good way into my reading. So here’s a review of a book I finished yesterday, and tomorrow we’ll have a book I finished today, with any luck. 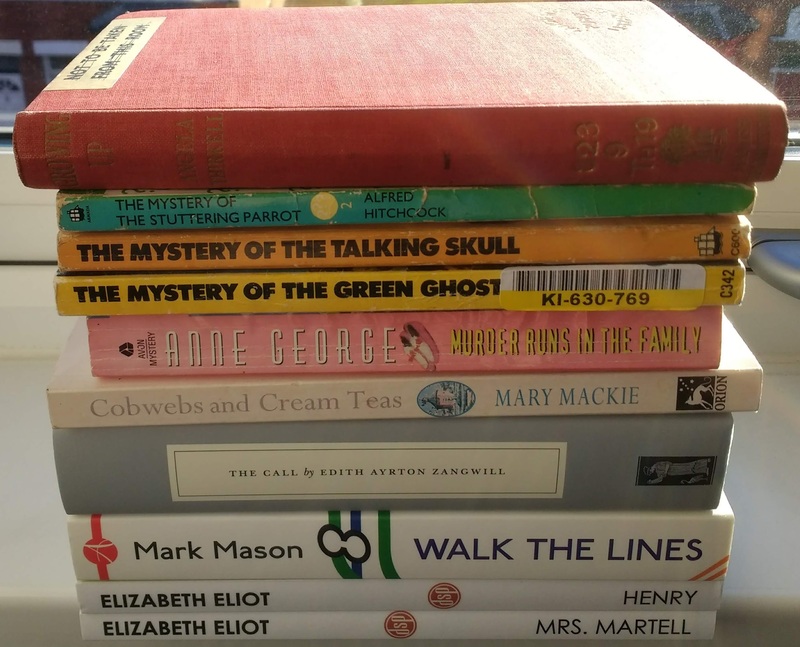 Also read on for some pre-Christmas acquisitions I made, fairly safe in the knowledge no one would have got them for me for Christmas (and I was correct in that assumption: phew!). I was attracted by the Big Stone Gap in the title of this book as I loved Adriana Trigiani’s novels set in this small town, but more than that, this turned out to be one of my top reads of 2018 (the reason why I save my Best Of list until 1 Jan: a really good book often creeps into Twixmas). American Wendy and her Scottish husband Jack decide, on a bit of a whim, to buy a rambling Edwardian house in a small town and set up a bookshop. They cheerfully admit they know nothing and they have no budget and are determined not to get into debt – while carefully checking their privilege as they go and reminding themselves and us that by no means everyone is as fortunate as they are in being able to make these choices – so they have a lovely DIY attitude and rely on their own skills and on slotting into their community (making sure the support flows both ways), easier said than done and with some mistakes and setbacks along the way. I love the way Welch explains exactly how they went about it (once they’d worked it out for themselves!) including such details as pricing books, arranging swap credits for donations before they’d even opened and working out what to do with bestseller hardbacks that dip in attractiveness almost immediately. She also explains that salient point that you have to love people almost more than you love books (something that some other booksellers approach from a different angle (see, Shaun Bythell’s “Diary of a Bookseller“; I have to say I prefer their attitude) as they, perhaps more than most, become a meeting point for the community and a listening ear for bereaved and hurting people who come in looking for or selling on books. The sense of community is lovely, from Adriana Trigiani opening the store for them to the day a man comes in needing help and they tap into their network and find it for him almost immediately. They give back to their community of booksellers by touring local states and establishing a network of second-hand bookshops, and there are many thoughtful words about the value of reading and bookstores. Talking of words, there’s a delightful strand running through the book explaining various British words and phrases which is very amusing. Much consideration is also shown to the town and area they live in. While it’s hard to get a way in sometimes, and local cliques can dominate, they understand the attitude of this poor region which often seems left behind in terms of funding initiatives and has a self-deprecating air: if you’re good and you’re here then you can’t be that good because you’re here, and also anyone who comes in and tries to start something will be treated with suspicion that they’re not in it for the long haul, and is likely to be talked about. They negotiate these issues with care and are honest about their mistakes, and this gives a depth to the book that adds to its bookshop opening genre. There are lovely animals which are not harmed in the telling of this book – always a worry; in fact, when there’s peril for one creature, it’s actually multiplied rather than lost! An excellent read. And so to two books bought from Any Amount of Books’ ever-reliable outside racks when I was in London with Emma earlier in the month. 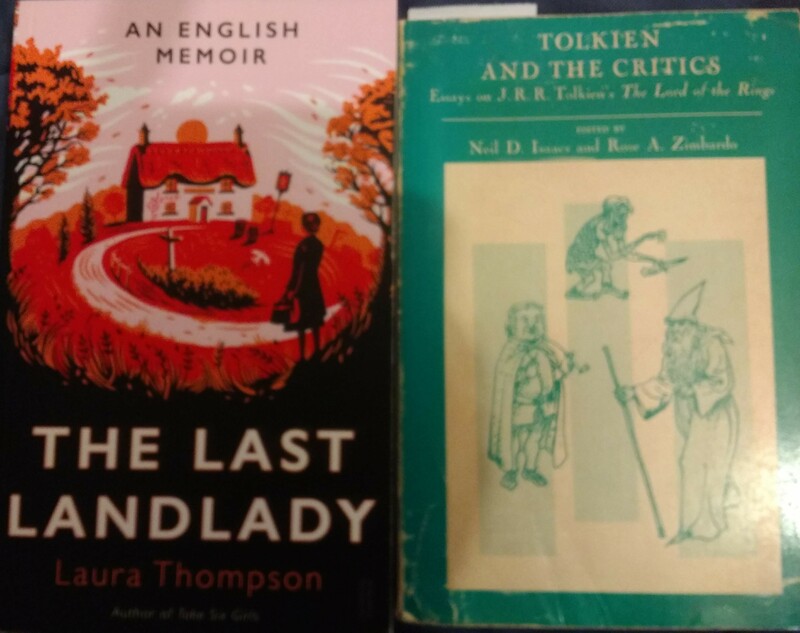 Laura Thompson’s “The Last Landlady” is a memoir about an English pub and the loss of such institutions, and by N.D. Isaacs and Rose Abdelnour Zimbardo‘s “Tolkien and the Critics” is a collected volume from 1970 that was hard to resist. I do try not to buy books near to the Christmas-Birthday season but it proved OK.